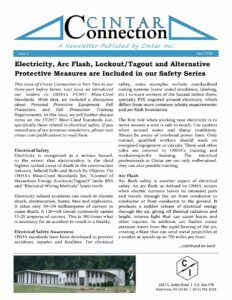 Cintar Connection Issue 5 - Electricity, Arc Flash and LOTO Safety - Cintar Inc.
Issue 5 of our Cintar Connection newsletter (attached) is Part Two in our Safety Series. This edition covers Electrical Safety, Electrical Safety Awareness, Arc Flash, Lockout/Tagout and Alternative Protective Measures. These areas all rank high on various lists for citations, injuries and fatalities. And because these topics can affect many of the industries Cintar serves, we felt bringing more awareness about them would be of value to our clients. We provide expert engineering and consulting services locally in Pittsburgh and beyond. Our staff is attentive to detail, and we offer cost-conscious solutions.